If the native soils beneath the bioretention planters are free of soil or groundwater contamination and porous enough to absorb the rainwater quickly, then bioretention planters can be designed to allow the water to percolate or infiltrate into the soils below. If infiltration is not feasible, they can be designed as flow-through systems that collect the water in temporarily pools before filtering and releasing it slowly into the sewer system. Storing the water onsite in a bioretention planter during heavy storms frees up capacity in the combined sewer system when it’s most needed. Filtering the water prior to release to the separate sewer system treats the water prior to release to the Bay or Ocean. Bioretention planters can also be used to capture rooftop runoff from disconnected downspouts. Because they can be effective even in small installations, bioretention planters are appropriate in constrained locations where other stormwater facilities are not possible. Wide range of scales and site applicability. Reduces runoff volume where infiltration is feasible and attenuates peak flows. Increases effective permeable surfaces in highly urbanized areas. Creates habitat and increases biodiversity in the city. Facilitates groundwater recharge (infiltration-based systems only). Requires relatively flat site and sufficient hydraulic head for filtration. Vegetation requires maintenance and can look overgrown or weedy; in the dry season it may appear dormant. Bioretention planters may be installed by small property owners, by major new development or as part of corridor-wide improvements. Bioretention planters are similar to sidewalk landscaping, but are designed to store, treat, and/or infiltrate stormwater from a larger catchment area. Bioretention planters located in the sidewalk area require a permit. A permit is required to ensure that the planter is properly constructed and maintained in order to maximize environmental benefits, protect public safety and limit conflicts with infrastructure. Bio-retention planters may require a sidewalk landscaping permit or a minor encroachment permit depending on the scale and complexity of the project. Consult with DPW to determine the appropriate permit for your project. If Bioretention planters will be installed in combination with other streetscape features, the project sponsor must obtain relevant permits for all features. Generally, DPW will combine multiple features into a single permit. Bio-retention planters may be built as a standalone feature, or in coordination with other greening and stormwater management features, such as street trees, channels and runnels, or permeable paving. Soils: Infiltration-based bioretention systems should be considered in areas where the native soils are sufficiently permeable, where there is no soil or groundwater contamination, and where the high water table and bedrock are at least 4 feet below the bottom of the facility. In areas where native soils have an infiltration rate below 0.5 inches per hour, or other infiltration limitations exist, bioretention facilities should have an underdrain. Underdrained biorentention systems can also be lined; these are known as “flow-through planters”. Flow-through planters are particularly valuable as receiving bodies for roof runoff when placed adjacent to buildings, because their waterproof lining allows them to be incorporated into foundation walls. Both types of bioretention systems may be placed in the furnishings zone to receive runoff from the sidewalk and street (through curb breaks). Slope: Bioretention planters are best suited to sites that have less than a 5% slope. For slopes greater than 5%, they should incorporate check dams or other flow control devices to slow flow. Project Types: Bioretention planters are appropriate for installation by both small projects sponsored by individual property owners as well as larger block-scale or neighborhood-scale projects involving multiple LID features. Sizing: Bioretention planters should be a minimum of 2 feet wide to accommodate underdrain systems, allow for planting room, and allow for constructability. Bioretention systems should follow the landscaping clearances required for sidewalk landscaping. The use of several small facilities, rather than one large facility is preferable, as it provides a distributed infiltration area. Typically, infiltration surface area should be 5 to 10% of the total paved area; however, this ratio depends on existing or underlying soil conditions. Materials: The depressed area should contain a surface layer of organic mulch, underlain by an amended soil plant bed. Deep rooted water tolerant plantings are encouraged to improve filtration. In very urban settings, pea gravel or river rock may be a more appropriate surface material to reduce maintenance needs. This upper layer captures larger solids and can be replaced fairly easily; however, with the exception of systems capturing roof runoff, additional pretreatment is recommended for all bioretention systems. Typical pretreatment methods for bioretention include vegetated buffer strips, swales, and sediment forebays. Curbside bioretention systems capturing street runoff should have, at minimum, a shallow gravel area at the curb inlet to capture larger solids and protect the planted system from erosive flows. Vegetation: Where possible, use native vegetation and/or plants that provide habitat value for local insects, birds, and other species. The plant palette should be selected for viability in well-drained soil, as well as periods of inundation during the rainy season. Vegetation should be drought-tolerant, especially at the edges which remain primarily dry, but may require irrigation during initial establishment and during the dry season, depending on the application and species used. Trees planted in flow-through planters require more intensive maintenance, and often show limited growth and vigor. Therefore, containers should not be used for street tree plantings except in limited situations with underground constraints and where sidewalk widths are sufficient to accommodate large containers. Drainage: Bioretention planters should be designed to drain stormwater within 48 hours after a rain event to avoid concerns about mosquitoes. Ponding depths should be limited to 6 inches or less for aesthetics, safety, and rapid draw down. Certain situations may allow deeper ponding depths up to 9 inches, depending on location. Ponding depths increase during larger storms until runoff overflows an elevated weir or drain outlet for discharge to the city sewer network. An overflow riser with a domed grate should be included for larger storm events. Pre-treatment measures should be included where possible to reduce the maintenance requirements of bioretention facilities and clogging of soils over time. Pre-treatment measures include: swales to filter out coarse sediments and debris, a forebay, or a pea gravel border which acts to spread flow evenly and drop out larger particles. An underdrain system should be used where sub-soil infiltration rates are less than 0.5 inches/hour. A gravel trench with underdrain should be used to allow drainage between rain events. If the system allows infiltration, it should be placed a minimum of 10 feet down-grade and 100 feet up-grade of building foundations. In some cases (outlined in the Stormwater Design Guidelines), these distances may be reduced with SFPUC approval. Accessibility: Where there is a vertical drop between the sidewalk and the bioretention planter, a 4-inch lip must be provided at the edge of the facility for tactile detection. 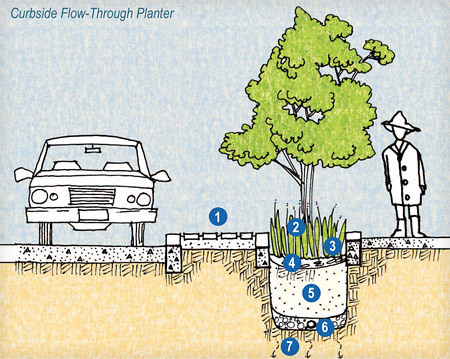 Roadway runoff should be directed into bioretention features by installing flush ribbon curbs on the street edge or small evenly-spaced curb cuts into the existing curb. The bioretention planter should include an exit point for stormwater overflow. Where building-adjacent planters are used, roof drains should direct water to these features first. Both underdrains and surface overflow drains should be installed with building-adjacent planters. Building-adjacent planters should be designed to pond water for less than 48 hours after each storm. Flow-through planters designed to detain roof runoff can be integrated into a building’s foundation walls, and may be either raised or at grade. When raised, planters can be designed with 14 to 16 inch vertical heights to incorporate a seat wall. Planters may be placed on either side of the property line to allow larger planting bodies to receive roof runoff (with Minor Encroachment Permit from DPW). Planters should be structurally separate from the adjacent sidewalk to allow for future maintenance without disturbing the sidewalk. An expansion joint satisfies this requirement. Maintenance responsibility for LID features including bioretention planters varies. Typically, if a property owner initiates street or sidewalk improvements such as a bioretention planter, they will be responsible for maintenance of those features. Specific requirements will be described in your permit. In some cases the City may install and maintain LID features such as bioretention planters. It is important to meet with the permitting agency early on in the process to develop a long-term maintenance strategy for your project. This will help expedite the permitting process and ensure long term functionality and success of your LID improvement. Like any landscape feature, bioretention facilities must be pruned, mulched and watered until the vegetation is established. Semi-annual plant maintenance is recommended, including weeding, mulching, and the replacement of diseased or dead plants. Mulch and compost improve the soil’s ability to capture water. Because some of the sediment that enters the planters may form a crust on the soil surface, limiting the porosity of the soils, some raking of the mulch and soil surface may also be necessary to maintain high infiltration rates. Periodic trash removal may also be necessary.